We just love this new iPhone/iTouch app created by our own Brother Bill. In Food Fight, you're a chef trying to defeat crazed veggies bent on destroying you. Jump and chuck your trusty copper pot and smash those evil veggies dead. And keep the sound on as you play because the SFX are funny. 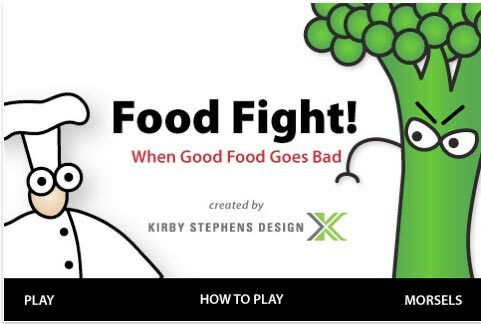 The game if free, so download the Food Fight app or search iTunes for it ASAP. Oh, if you're a frequent reader of YBNBY, you might want to look for a secret reference somewhere in the game.